Finding a balance between being a good Jew and a good global citizen. Being a Jew in the 21st Century presents new challenges. Jews are part of a globalised world. We are no longer a ghettoised people, unless we choose to self-impose a ghetto. Thus we are challenged with how to properly bring our Jewish ethics and values to bear on our interaction with a world full of different peoples. 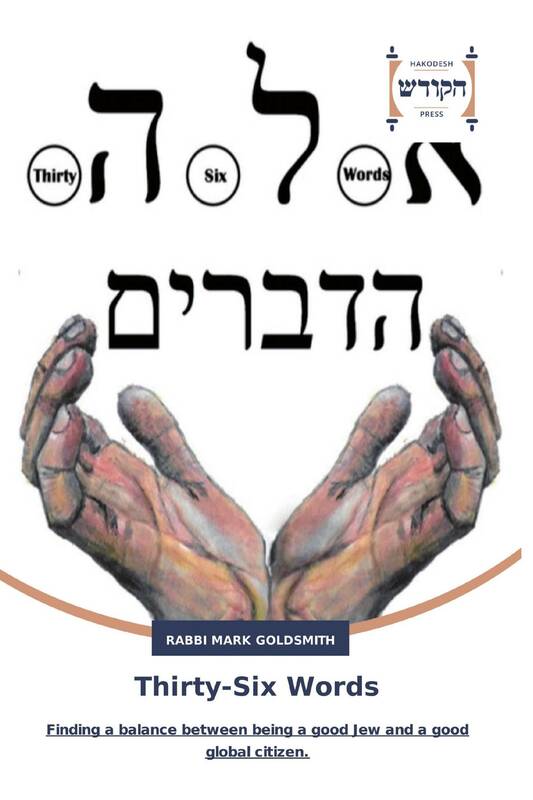 As Rabbi Laura Janner-Klausner writes in her foreword, “Rabbi Goldsmith knows that the task of Jews is to improve, heal, transform the world and he calls on us to play our part in this work, human work, Jewish work, God's work.” Thirty-Six Words is a collection of short pieces drawn from the author's over twenty years of preaching and writing as a Reform Rabbi. They consider Jewish ethics, global concern, memory and texts, ritual, society and thought for Jews who embrace today's world. The book includes an index to all the Jewish texts cited, together with an extensive glossary for the reader who needs help with Jewish terminology. It is intended for the general reader, Jewish or not, who wants a book of thinking around 21st Century Judaism which can be read meaningfully in short bursts. * Cover illustration: Miriam Goldsmith.